Thursday marks International Mother Language Day. The day was proclaimed by the United Nations Educational, Scientific and Cultural Organisation (UNESCO) in 1999.
International Mother Language Day aims to promote the preservation and protection of all languages used around the world. The day is also observed to promote linguistic and cultural diversity and multilingualism. The date represents the day in 1952 when students demonstrating for recognition of their language, Bangla, as one of the two national languages of the then Pakistan, were shot and killed by police. More than 20 schools from the Ugu District on the KwaZulu-Natal south coast have gathered at Umzinto to celebrate World Mother Tongue Day. There are currently 11 official languages in South Africa: English, Afrikaans, isiNdebele, isiXhosa, isiZulu, Sesotho sa Leboa, Sesotho, Setswana, Siswati, Tshivenda and Xitsonga. The aim of the gathering is to encourage the proper use of indigenous languages. Sizwe Mbhele from the KZN Provincial Education Department says various race groups will get a platform to share ideas on their respective languages and cultures. Mbhele says they will also reflect on history and contribute to the renaming of certain areas that are deemed to have been improperly named. Meanwhile, renowned playwright and author Gcina Mhlophe has expressed concern about the misuse of indigenous languages. The Pan South African Language Board says although it is making progress in helping San people of South Africa to have their languages officially recognised; their efforts are still falling short. A large majority of the San people live in the Northern Cape and speak indigenous languages such as !Xun, Khwe, Nama and others. Language Board Provincial Manager Boichoko Moremi says they are engaging universities and language experts in the country. A leader in the Khwe tribe living at Platfontein near Kimberley in the Northern Cape, Vincent Katjarra has accused government of dragging its feet in recognising their languages. When a language disappears, it takes with it an entire cultural and intellectual heritage. 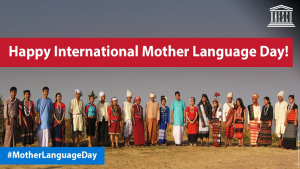 RT @UNESCO: 21 February is #MotherLanguageDay! The post Thursday marks International Mother Language Day appeared first on SABC News – Breaking news, special reports, world, business, sport coverage of all South African current events. Africa's news leader..